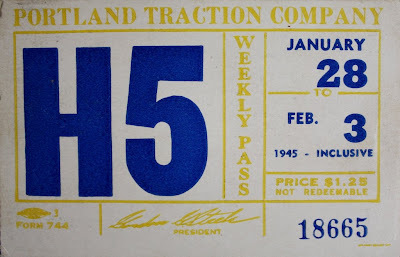 Portland Traction weekly pass, April 14-20, 1940. 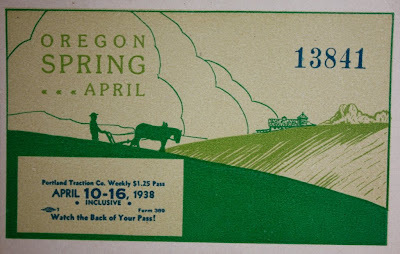 By the 1930s, Portland's transit network was in desperate need of modernization. Most of the city's streetcars had been built before World War I and were showing their age. Ridership decreased as maintenance costs rose. 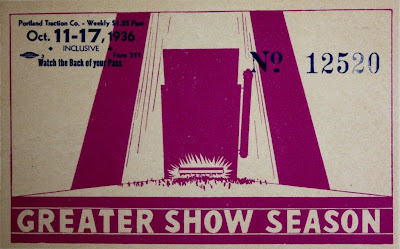 Fairs, constrained by franchise, were locked in place by the city. 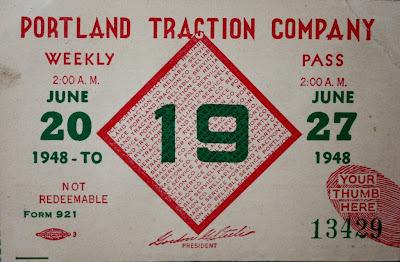 To isolate the financial loses from its electric utility corporate parent, the transit lines were re-organized, first as the Pacific Northwest Public Service Company, then as the Portland Traction Company, with little visible changes to the riding public. The once world-class system was the topic of angry newspaper editorials and the city council agenda. 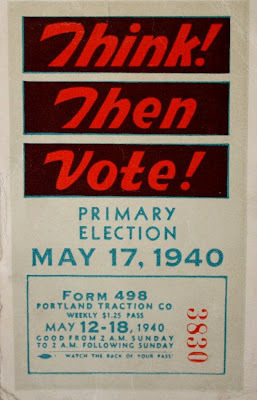 Portland Traction city lines car #439, near the east end on the Broadway Bridge on the Bridge Transfer line, so named because it connected each of the routes that crossed the downtown bridges on the east side of the river. (Click on pictures to expand). 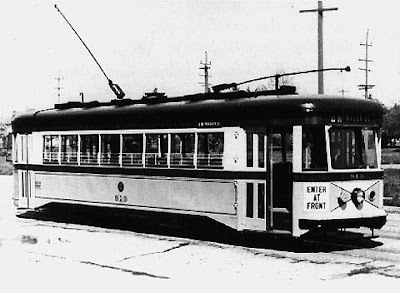 The situation began to be addressed in 1932 with the introduction of fifteen modern streamlined streetcars. Built by Philadelphia's J.G. 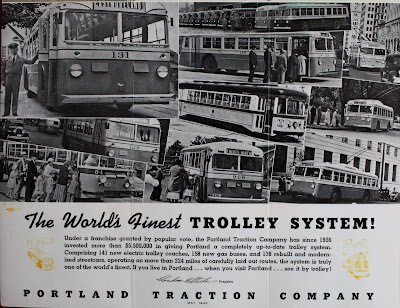 Brill Company, they were soon nicknamed the "Broadway cars" for their initial assignment on the line that connected northeast Portland to the premier entertainment district downtown. As delivered, the "Broadway cars" had gray sides with an ivory window band that was bracketed by hunter green borders, with black roofs and striping. 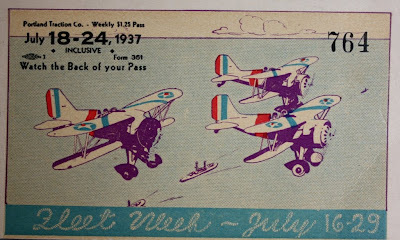 The complex paint scheme lasted only a few years before being replaced by simplified green and cream colors, which were in turn replaced by maroon and cream in 1940. No known color photograph of the original paint scheme is known to exist. "Three new modern cars went into service yesterday on the Broadway line and did a rushing business. It seemed that passengers wanted to try the new cars and loaded them to capacity, often allowing the old-time cars to pass by to permit them to ride the new cars." 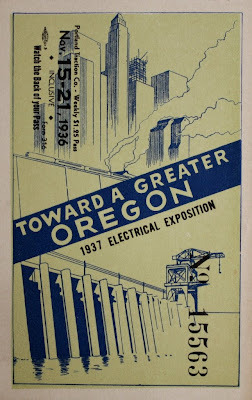 -The Oregonian, May 16 1932. The cars were popular with the public and soon found use on many of the systems heavier trafficked lines. They did nothing however to address the problem of moribund track and infrastructure. 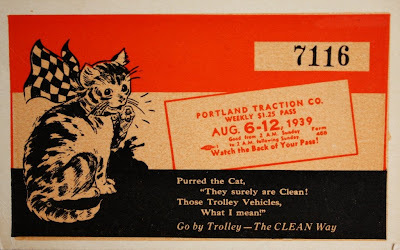 It would not be until the 1937 adoption of electric buses, aka "trolley coaches," as told in the post Off Line Too Soon, that a turn-around of Portland's public transportation system took place. 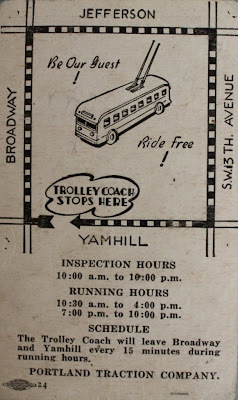 The "World's finest trolley system" brochure / map highlighted the "trolley coaches" (seven pictures), gasoline buses (two pictures) and modern streetcars (one picture). 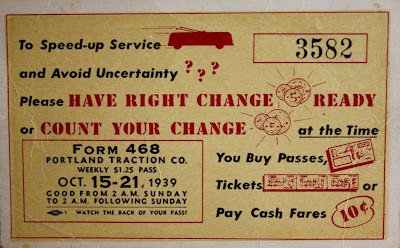 A typical weekly transit pass from the early 1930s. New equipment was not the only way to re-engage the public. 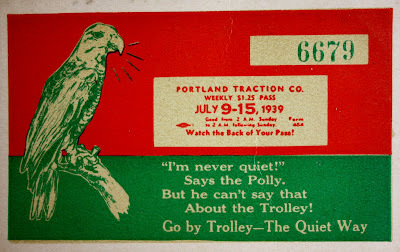 Starting in the mid-1930s, Portland Traction mounted a campaign that transformed the utilitarian weekly transit pass into a colorful showcase of community life. 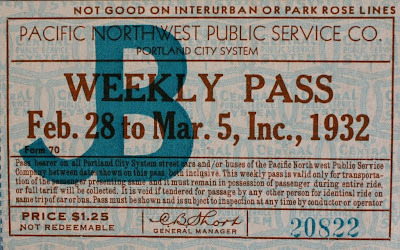 The passes, created by anonymous graphic artists, provide a view of Portland's depression era values, pride, aspirations, hidden prejudices, current affairs and in some cases, out and out whimsy. 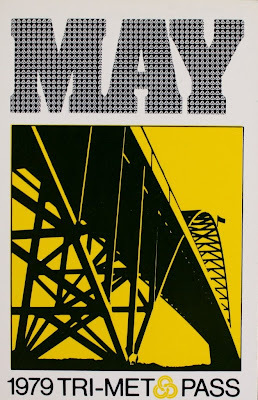 "See Portland from the Heights." Even though the amusement park atop Council Crest had been closed for seven years, a trip to the top of the line was still viewed as worthwhile in its own right. 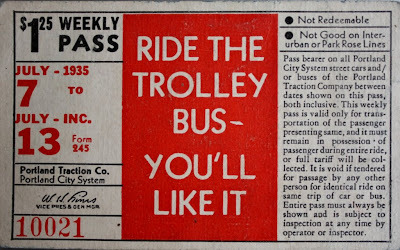 "Ride the Trolley Bus- You'll Like It" advertises the downtown test loop built to gauge public acceptance of electric buses in 1935. On the flip side was a map (below). 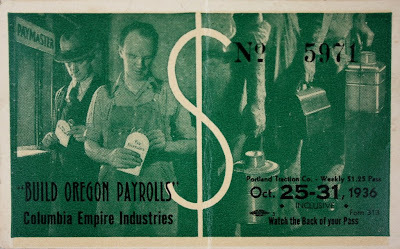 "Build Oregon's Payrolls" brings to mind the Forgotten Man finale in Busby Berkeley's Gold Diggers of 1933. 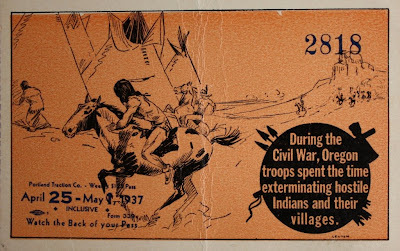 "During the Civil War..." is amazing for its bland, stark statement of self-evident justification, bereft of regret, apology or even euphemism. Not fighting, not removing... but exterminating. 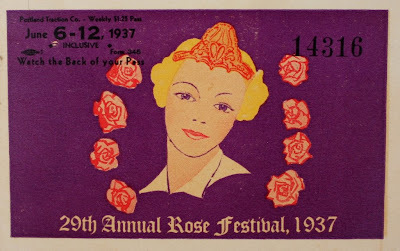 29th Annual Rose Festival 1937. 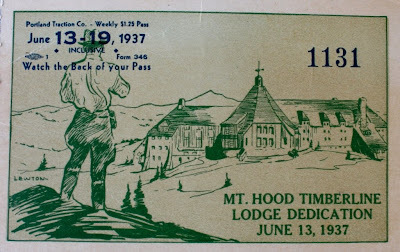 Dedication of the WPA built Timberline Lodge, June 13 1937. 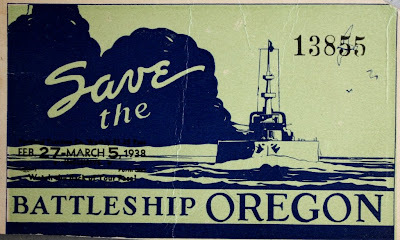 Save the Battleship Oregon- a successful effort, until a World War II scrap drive. 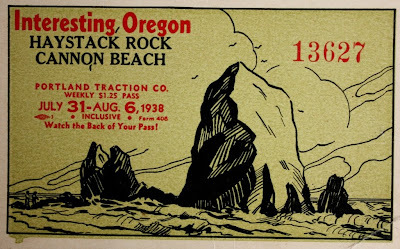 Haystack Rock, part of the "Interesting Oregon" series of passes that features locations throughout the state. Tractionetiquette- have your change ready. 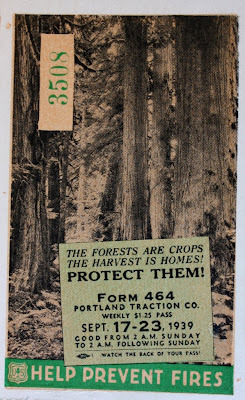 The forests are crops, the harvest is homes! 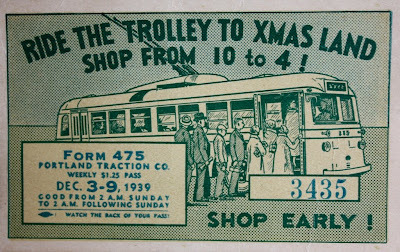 Ride the trolley to X-Mas Land. 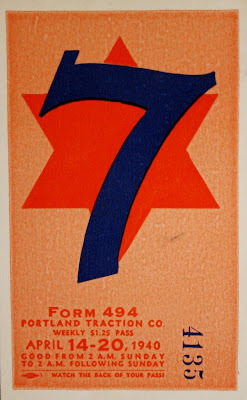 An enigmatic series of numbered passes from 1940 whose significance is unknown. 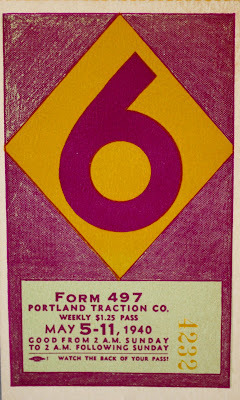 World War II bought an end to the era of Portland Traction's colorful weekly passes as wartime austerity found a graphic equivalent. "...Step up...Speed up...This is War!" 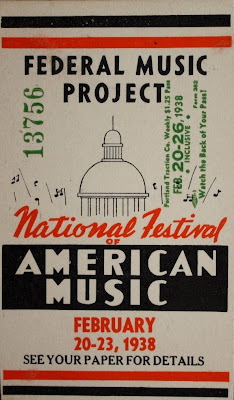 The front and back (below) of the January 28- February 3 1945 pass. 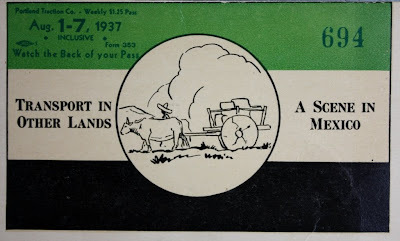 The post-war era brought little in the way of improvement, other than the handy thumb guide. 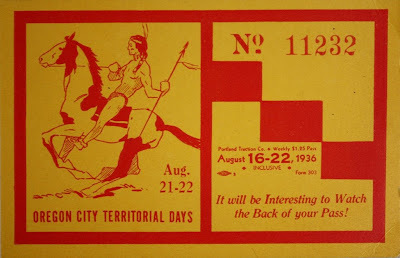 Passes were revived for monthly use in the Tri-Met era. 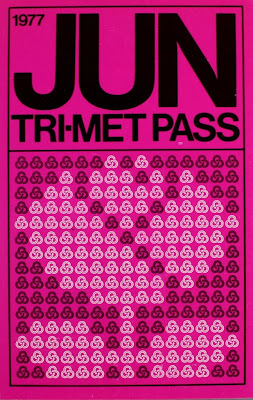 1977's passes featured a symbol for each month, in the case of June, a rose. In hindsight, a basketball would have been more appropriate. 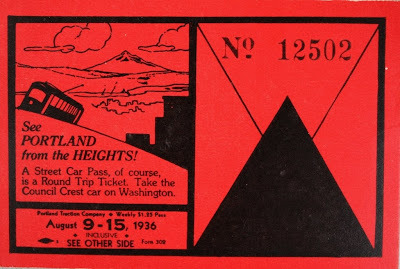 The 1979 Tri-Met passes featured Portland's bridges. 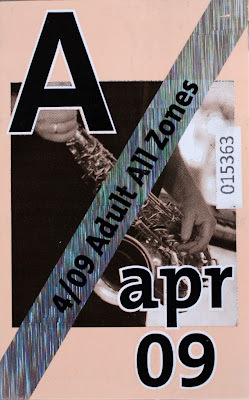 Monthly passes continue to this day on Tri Met. They are colorful and functional, but have looked much the same for the last few years. In a city full of graphic designers, what might be possible? 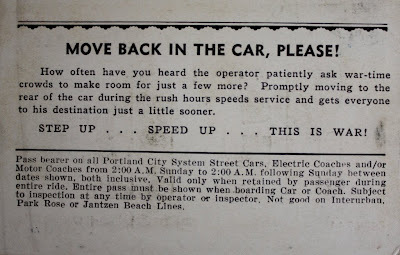 After all but the final three streetcar lines were abandoned in 1948, the "Broadway cars" were assigned to the Twenty Third Avenue line that linked downtown with northwest Portland where they ran until the end of the original streetcar system in 1950. 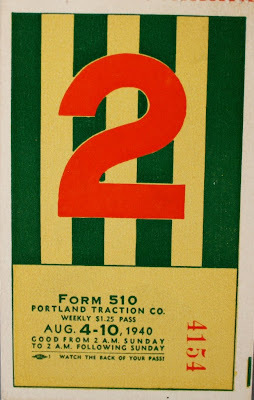 After abandonment two of the cars were re-gauged and transferred to the Portland to Oregon City / Bellrose interurban lines that ran until 1958. 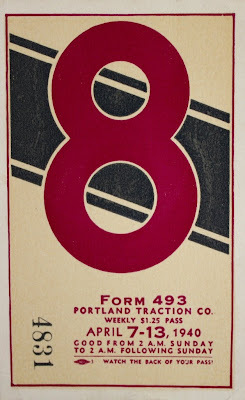 One of those cars, the #813, survives to this day and can be ridden on the Willamette Shore Trolley line between South Waterfront and Lake Oswego (service is temporally suspended due to trestle work). 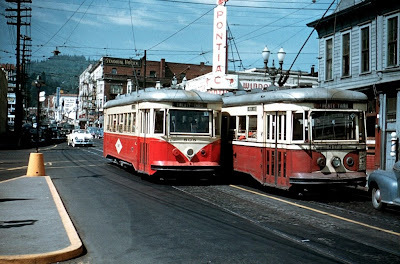 The #805 (in the final "tomato red" color scheme adopted after 1948) and the #804 (in post 1940 maroon and cream colors) on the Twenty Third Avenue line at Nineteenth and Burnside, circa 1949-1950. The blue-gray building to the right is now the location of a McDonalds. 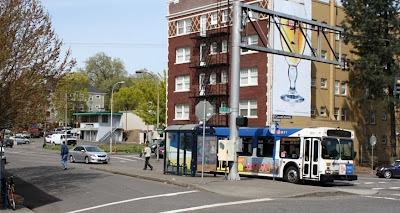 The #807 turns off of Burnside on to Washington at 15th. The brick apartment building still exists, but the Studebaker Used Car Department building is now where the off-ramp from I-405 joins Burnside. Fantastic post Dan - really great history. Thank you for posting those photos of Burnside!! I always wonderered what the Marquette (now the Empress Condo's) had next to it. It always seemed so lonely for another building when I lived there. Thank you for updating! I'm glad to find this post!